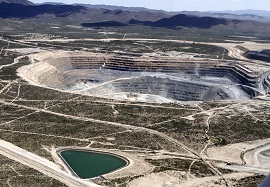 Peñasquito is a surface mine hosting one of the world’s largest silver, gold, zinc and lead reserves. It is located in north central Mexico, in the state of Zacatecas, approximately 124 miles northeast of the city of Zacatecas and 15 miles south of Concepción del Oro. At a gold price of $1,200 per ounce, a silver price of $18.00 per ounce, a lead price of $0.90 per pound, and a zinc price of $1.05 per pound.